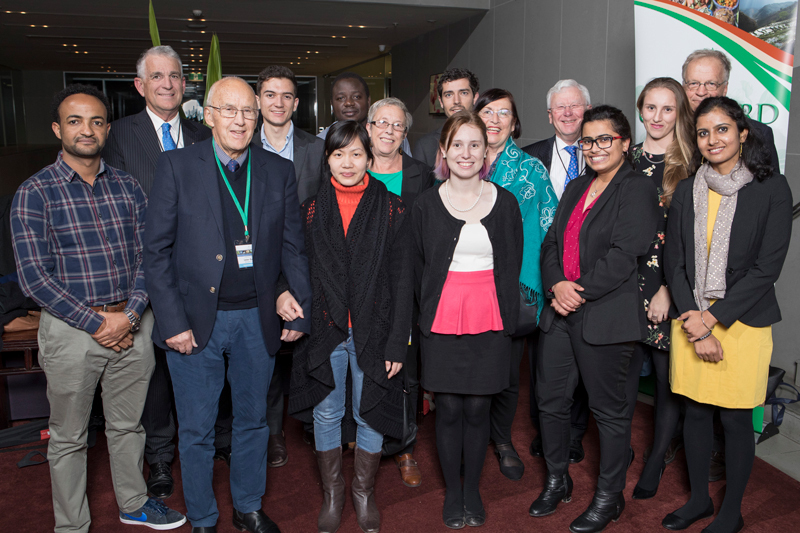 Nine NSW scholars were sponsored to attend the 2017 Crawford Fund conference this year in Canberra. Three scholars were proudly sponsored by the NSW Crawford Fund State Committee. Scholarships are offered to young Australians with a genuine interest in international agricultural development, to attend the conference. In addition, we are pleased to have had two scholars sponsored by the Graham Centre for Agricultural Innovation, Charles Sturt University, two scholars sponsored by the University of New England, and one scholar each sponsored by Elanco Animal Health and The Fifth Estate. We would like to thank our mentors for their guidance, support and commitment to the scholars throughout the conference. I made a decision to apply to attend the Crawford Fund Conference 2017, with the theme Transforming Lives and Livelihoods; The Digital Revolution in Agriculture, Ideally the theme corresponded with my research area; poverty reduction, and food security in the Sub Sahara Africa. It was a critical decision to me because I was at the final phase of my PhD candidature, and my thesis was due for submission in weeks. However, this was a conference that anyone interested in agricultural development particularly in developing countries that are still entrenched in food and nutrition insecurity could not afford to ignore. The Keynote address presented by Dr Lindiwe Majele Sibanda reflected the main theme of the conference ‘Transforming Lives and Livelihoods: The Digital Revolution in agriculture’, outlined a new narrative on how to end global hunger. This presentation was quite momentous to me as it added a new dimension of food nutrition beyond food security which had been my pre-occupation both at theoretical and practical levels. It also highlighted the significant role played by women in food security and nutrition in developing countries, considering the fact that two thirds of smallholder agricultural labour force comes from women. And with smallholder agriculture being a dominant sector for socio-economic transformation, agricultural research and international development ought to explore new discourses that situate women, and girl children at the forefront. Other presentations were significantly impacting too: Open data for Agricultural Nutrition: Big Data for the little guy— touched aspects of rising population, dramatic climatic changes, and technological advances. However, through meaningful partnerships with the farmers, science based approaches can make positive changes in the lives of millions, as well as on the environment we live; ICT adding value for smallholder farmers—highlighted levels through which digital agriculture can empower smallholder farmers. The intersection between water, energy and food and nutrition was promptly elaborated and connected to SDGs 1; and the Transformational Change Based on Innovation Platforms was equally very imperative. Digital service innovations are highly critical, taking an example of Uganda where farmers immensely provided prompt information on their phones about the impact of bacteria on their banana plantations. Mentoring and networking was exemplary, highly enriching and rewarding— I shared a lot with my Mentor, Peter McCawley, a distinguished economist, with a glowing career in international aid and development. We shared a lot and I learnt more from him and we are continuing to collaborate and share more. I also had opportunity to meet Professor Robyn Alders, whom I had read a lot of her work in Sub Sahara Africa, how her efforts were transforming and positively impacting on lives, particularly women. This was indeed inspiring. I met Professor Petra Tschakert, and particularly picked up interest on her work regarding climate changes and smallholder agriculture in West Africa. I had opportunity to talk to Professor Andrew Campbell, particularly ACIAR’s effort through Cultiv Africa project in Kenya and East Africa. I networked with number of scholars from the Universities all over Australia, whom I hope to continue collaborating with in Agricultural research and international development. Finally, I would like to seize this opportunity to convey my thanks to NSW state committee for giving me a scholarship to attend this wonderful conference. I also would like to thank the organisers of the conference – it was indeed worthwhile. The 2017 Crawford Fund Conference encouraged me to value diverse agricultural systems, perspectives and skillsets. Valuing diverse agricultural systems was a feature of the conference. Dr. Lindiwe shared a powerful personal story to convey the nutritional consequences of eliminating diversity from smallholder farming systems. Professor Mario Herrero continued the conversation when he presented his paper ‘Farming and the geography of nutrient production for human use: a transdisciplinary analysis’. Using gigantic datasets, Professor Herrero demonstrated that diverse agricultural systems are “necessary to maintain the production of diverse nutrients and viable, multifunctional, sustainable landscapes” (Herrero et al., 2017). This not only provided valuable evidence for the importance of diversity but also for the potential of ‘big data’. I am studying remote sensing at university this semester so it was inspiring to learn about such a meaningful application of it! Valuing diverse perspectives was another feature of the conference. An area of contention was the debate surrounding open source data. Steve Mathews (Founder and CEO of Gro-Intelligence) argued that collecting and cleaning data is a demanding process that must be paid for in order to provide the service sustainably. Dr Ken Street disagreed and stressed that private sector enterprises may manipulate datasets to provide clients the statistical results that they are looking for. André Laperrière (in an informal conversation) added that open source data has been found to generally be more reliable. He explained that making data sets open to public criticism creates an incentive for rigorous data collection/cleaning. He cited Wikipedia as an example of publically available knowledge that is relatively reliable. The conference encouraged us to embrace these diverse perspectives. The areas of contention were not only the most interesting but also the most thought provoking. This enabled me to realize the importance of engaging in debate beyond the science community. At the student day, John Anderson (Former Deputy Prime Minister of Australia) highlighted the importance of facilitating frank but respectful debates. He emphasized that good policy requires all stakeholders to be given a legitimate voice. He encouraged us students to not only participate in these debates but also reflect on them with reason. Valuing diverse skillsets was a third feature of the conference. At the student day, a recurring theme was becoming a well-rounded professional. In an informal conversation, Professor Lester Burgess convincingly articulated the power of combining ‘hard’ technical skills with ‘soft’ people skills. Another salient point was the importance of developing networks in order to tap into other people’s knowledge and skillsets. I took so much away from the 2017 Crawford Fund conference. It was an amazing opportunity to connect with experienced (and aspiring) international agricultural researchers. I got on the bus back to Sydney with so many new ideas to reflect on. Thank you to the Crawford Fund for the incredible opportunity – I am genuinely grateful for it. The Crawford Fund conference has already gone up in my list of “Highlights of the Year – 2017”. The experience was very raw and amazing. There are several reasons contributing to it. One of which was the topic of discussion at the conference. Digital agriculture is an extremely active field with endless potential presently. It also happens to be the one in which I want to work in. The conference was good because not only did it present what is being done in the digital field of agriculture but also emphasised on the reasons why there is need to embrace it. This was accompanied by excellent presentations by industry leaders in the field. The information presented was excellent, some of which I did not know of. Some of them highlighted the new innovations developed in the industry and its potential and applications whilst others highlighted issues that are present in the industry with a focus on small-holder farmers. Some presentations that really caught my interest were the GODAN presentation by André Laperrière and CGIAR presentation by Andy Jarvis. André’s presentation was interesting because he talked about open data and how GODAN is working on it. It is a very important issue, especially for someone like me who is a budding scientist in the data world of agriculture. Additionally, just the case studies of the digital media use in predominantly small-holder countries like Ghana and Ethiopia was refreshing. Andy’s presentation was as interesting as it gave some current facts about the technological adoption however, they were surprising. For instance, agricultural ranks last in the USA in terms of digitization. I anticipated agriculture would not rank first but was not expecting it be last either. Some of the constraints that he mentioned that are very critical is the inherent complexity found in agricultural data. This also leads to noisy datasets which is another issue. One of the important things that need to happen in the industry as mentioned by Andy is increased public extension. Where the farmers need to see the opportunities and benefits of the various products that are developed or being developed. For which human interface is important. Now getting to student experience, I personally found the Conference both intellectually and socially enriching. The several networking opportunities we received over the 3 days were incredibly useful. The delegates present at the Conference were very approachable and helpful. The repeated networking events also gave us the opportunity to think about our conversations with the delegates and follow-up with queries at the next event. At a personal level, I found the networking events combined both social and intellectual aspects, as I had very interesting and inspirational conversations with some of the delegates. Most importantly, the conference and the networking events exposed me to different ideas. Ideas on what road can be carved after I pass my current stage. Something else I noticed, that there were a few presentations that were only focused on issues with no input made to suggested solutions. While highlighting the issues is important, I thought as young scientists we are told to at least think about some solutions to a problem while presenting them. But overall, I absolutely enjoyed the Conference. This was the first official Conference I attended and my patience yielded sweet fruits. Attending the Crawford conference as a scholar was a very enriching experience for me. It put forth so many diverse popular as well as emerging perspectives on digital revolution in the sphere of agriculture. I believe the best part of the conference was to be able to meet people working in the same field and share and learn from them about their work and experiences. Even more amazing is the fact that I can stay in touch with them, share each other’s work and keep enriching our work or study areas, PhD currently for me, personally and hopefully later also. It was interesting to see how people from different age groups, countries and even different interest but parallel goals could be in one common space and interact. I think if not for such a platform, I would be apprehensive to approach so many experienced people. I got to personally meet so many people, with so much of an expertise in the field of agriculture and get insights from them, thanks to the scholar-mentor linkage program. The parliamentary conference too was full of enthralling and informative talks. The quality of the presentations as well as the speakers were excellent. For me personally, one of the most attractive and inspiring part of the conference was the talk given by Dr Lindiwe Sibanda. The effortless way in which she put forward her not-so-easy journey of life and linked it with the present global concerns in the sphere of agriculture and nutrition was just magnificent and though-provoking. Listening to her that whole hour was motivating of the spiritual kind. I have returned to my office with greater enthusiasm and conviction. The facilitation of the scholar day was very impressive and it provided a great opportunity to have short discussions with a number of researchers. The conference gave me an opportunity to be a part of the RAID network, which I think is a useful platform for early career researchers to learn and access a lot of relevant insights, knowledge and opportunities. Especially for me, doing a PhD in Australia with my study area in India with smallholder farmers, it was wonderful to become aware of the enormity of academics and researchers working with smallholders all over Asia and to know of the challenges, uncertainties, high or low point they face. It reassured me that the sporadic uncertainty that I face in my research is only normal and that I should come out of that with greater energy. In a nutshell, the whole conference added enormously to my professional and research network and I am thankful to Graham Centre for providing me with this opportunity. I hope next time the conference also has some policy level discussions and some more perspectives from the field as I think these are the two ends which is essential for us researchers to link, connect and work with. I look forth to staying connected with all those who I met at the conference and would also love to attend the conference next year, if the topic is of interest to my research. Attending the 2017 Crawford Fund conference gave me so much more than I could have ever expected. I had initially thought it was just the conference theme ‘Transforming Lives and Livelihoods: The Digital Revolution in Agriculture’ that was relevant and of interest to me but this conference opened so many doors for me that I was not even aware of. I was so inspired by many of the people in attendance – particularly Dr Lindiwe Majele Sibanda. Her talk on the opening night encouraged people to think outside the box of ‘higher yields’ and emphasised that nutritional diversity is extremely important. The idea that we need to incorporate nutrition in with our agricultural ways rather than just producing more food (and subsequently wasting it) was one that makes so much sense yet is not something we readily think about. The answer to overcoming this is to collaborate with the health community and develop agricultural frameworks that involve nutrition as the central idea. I benefited from so many of the talks, especially Dr André Laperrière who presented on big data for small-holder farmers and how it can change their lives and livelihoods. He explained that data collection is a two-way street. When farmers provide data it builds on the knowledge bank which in turn provides farmers with management advice. Communication between our researchers and farmers and subsequently the public is something that is becoming increasingly important. The link between research to its development and application in the field is something that I have not seen much in my career so far and I saw it readily at the conference. The notion that whatever research we do in agriculture, we are all working towards the same goal of food security, is one I think many of us either forget or had not even thought of. This is one of the best conferences I have ever been to in terms of networking. The exposure to such a diverse range of people including other students, early career researchers, academics, researchers and industry was fantastic. The opportunity to be involved in the scholar day and be paired up with a mentor was fantastic and I hope to see more programs like this in the future. I particularly enjoyed the workshop style sessions at the scholar days which allowed for open communication between people. The sessions presented at the conference provoked me to think about how my research can impact the agricultural industry both in Australia and overseas – whether it be a technique I use or my overall results. My work involves large amounts of data collected from abattoirs and the use of this data and its dissemination to researchers like myself as well as the farmer has become of increasing interest to me. The Crawford Conference encouraged me to think about how this could be applied outside of Australia and I am excited to think about how we can collect useful data that can provide information to multiple parties. I now have a renewed perception on agricultural research and my PhD. I was very lucky to be selected as a scholar of Crawford Fund Conference in 2017 with the title: “Transforming Lives and Livelihoods: The Digital Revolution in Agriculture”. The conference was a great opportunity for me to know more about international agricultural research in Australia, to learn the new knowledge and socialize with people involving in the agricultural research in Australia. In my home country, I have been working as a lecturer at the Faculty of Animal Science at Vietnam National University of Agriculture. Through the international cooperation research project, I had opportunities to work with researchers from France and Thailand. I recognized that international cooperation projects could bring many benefits for the researchers from both countries to share knowledge, working experience and to transfer new techniques in the agriculture sector. Australian agriculture in general and its animal production in particular has been developed extremely successfully. Thus, I always desire to develop the cooperation research with the research institutes/universities in Australia. The Crawford Fund Conference helped me to get closer to my dream. During the conference program, I was introduced to many international agricultural research funded by the Australian government, which are being implemented in developing countries in Africa and Asia. I was very happy to know that there are many of these projects underway in Vietnam (my home country). The findings of one research project funded by ACIAR were presented by Dr. Pham Thi Sen – ‘Farm level data for decision making, evaluation, traceability and quality assurance.’ Food safety is a current problem in Vietnam and I think the project provided huge benefits to the development of a safe vegetable production sector in Vietnam as well as increasing its market opportunities. During the additional program for scholars and mentors, I also learned that ACIAR had a project on cattle production in the Centre region in Vietnam. The husbandry techniques from Australian researchers helped to shorten the reproduction cycle in cattle; therefore, increase the animal productivity and profit for the small-scale farmers in Vietnam. So, personally, I think international research projects funded by Australian government had brought many benefits to participating countries and those also help to build up a food secure world. During the conference day, I listened to many presentations on how the digital revolution can transform agriculture. The agricultural sector is currently the lowest sector in applying digital innovation. So, digitalizing agricultural systems will become important to increase the farm profit and it can be made possible through the mobile phone. The data from the presentations pointed out that small-scale farms are still predominate and therefore, play an important role in food production over the world. A presentation by Dr. Andy Jarvis from the International Centre for Tropical Agriculture showed that the number of mobile phones in the world is more than the number of toilets. In some regions in Africa, farmers even have two mobile phones. So, applying digital advancements through the mobile phone system is possible for smallholder farmers. From the mobile phone, farmers can have updated information on market demand and can contact easily with the buyers or distributers. Thus, data revolution and digital application will bring huge benefits to the farmers. Through the activities for scholars, I also met and talked with many new people from research organizations and other universities. It was a worthwhile experience for me to develop communication skills, learn the new things and importantly to build up my self-confidence. After the conference, I participated in a 3MT presentation competition at the University of New England and I think I did well because I did not feel nervous anymore. The activities between scholars and mentors were also very good for me to build the network, learn the new knowledge and have the new ideas, which is important to develop my career. In general, I benefited greatly from participating in the Crawford Fund Conference. My participation in the Crawford Fund 2017 conference in Canberra gave me a great opportunity to learn from, and network with, the international agricultural research community. In addition to getting the right and positive answer to the central question of the conference which is having access to and better interpretation of data and information to improve agricultural productivity and profitability, the following are some of my key reflections. First, having a mentor for young scholar like me was a wonderful family arrangement to learn from real stories and help create a real network for the future. For me it created a moment to learn critical issues related to the challenges and opportunities about smallholder farmers in developing countries. My mentor, Peter Wynn, Adjunct Professor of Animal Science, taught me about smallholders’ issues in Pakistan, for me who knows only about smallholders in Africa, by sharing his experience in a dairy project he was leading and he was involved in implementing. I also shared my little experience about working with multi-stakeholder arrangements called Innovation Platforms for smallholder’s development in Ethiopian highlands. The second and most important part of the conference I found inspiring and touching was the talk given by Dr Lindiwe Sibanda about her grandmother’s farm that exactly explains what happened to the smallholder farms in Africa including in my country Ethiopia. It tells the story of how the African agriculture underperformed for the last couple of decades, the reasons behind this, and urges a rethink for scholars and all stakeholders to take actions to support smallholder farmers to achieve global food and nutrition security. My take home message from this talk was that it is time to re-think what we have been doing regarding food security and we need to go beyond increasing production and productivity and we have to achieve multiple goals at the same time – climate smart and nutrition sensitive smallholder agriculture. Finally, one of my bigger expectation to participate in the conference was because of the terminology “Innovation Platforms” I have seen in the program. This term attracted my attention more than anything as I am familiar with the term and have been using it while I was working for International Livestock research Institute (ILRI) back in Ethiopia. We use it as one approach to operationalize agricultural innovation systems which is a multi-stakeholder arrangement used as a space for prioritization of constraints and identify opportunities at local level. Now I have broadened my knowledge and learned the different use of the term innovation platforms in different contexts at higher level. The Crawford Fund is a conference I’ve had my eye on for three years now, since my first year of undergraduate studies when I missed the opportunity to attend with my university by mere hours. Finally, this year as a third year double degree undergraduate student, I decided to take the plunge and apply through the Crawford Fund for a scholarship. Private animal health company, Elanco, offered to cover the costs associated with attending the conference and I was ecstatic; I counted down the days and had my outfits picked a week before! As I started speaking to people when I arrived at the first scholars day, I felt instantly underqualified – I’m merely an undergraduate student with no research under my belt who’s never been to Western Australia, let alone overseas to see how agriculture is done there! I knew I was faced with two choices – give up and go home, or accept that I’m just earlier in my career path than everyone else and utilise their knowledge of the industry to assist myself in setting my own goals and directing my future. That’s what I did. I took the opportunity to speak to everyone who had even the faintest of a similar interest with me and I picked their brains. I asked about their undergraduate course and their postgraduate path; I asked about their current research; I asked for advice. Since returning to Sydney, I’ve begun to arrange some research assistant opportunities to get experience in the field, begun to read more widely, and joined the Society for Reproductive Biology and the Australian Society for Animal Production. I consider the networking interactions I had with older students and researchers to be the most valuable component of the week for me. This year’s conference theme was digital technology within the developing world. As a lucky citizen of Australia I knew that our technology is rapidly developing and becoming more complex than even I’m able to comprehend. But what is it like in other countries? Countries who still work with pen and paper? Who is taking the time to develop technology for countries that are decades behind our own? And most importantly… Is it working? The simple answer is “Yes”. The long answer is that there is much to consider – is it easily usable for someone who’s never owned such technology before? Is it cost effective? Is it compatible with the language they speak? This conference made my mind buzz with questions for three whole days! Dr Lindiwe Majele Sibanda, the presenter of the 2017 Sir John Crawford Memorial Address was a truly enlightening and encouraging character for me, and her memorial address was thought provoking. Although she originates from a very different place and time from myself, she shares a similar field interest, and has become incredibly successful in said field, not because she had to, but because she wanted to. I was encouraged by her idea of rewriting the agriculture narrative to not simply say “we need to make more food,” but to be a more nutritious one; quality over quantity. I cannot begin to thank Elanco representative, Jessica Ramsden, for the time she spent talking to me and encouraging me throughout the conference. I’d also like to thank Dr Helen Scott-Orr, my mentor for the duration of the conference. The conversations I had were insightful and I feel more confident for having had them. The 2017 Crawford conference and associated scholar days were a fantastic opportunity for me to broaden my horizons, learn more about international agriculture, and also develop my networking skills. I am very thankful to my employer, The Fifth Estate, for giving me the opportunity to attend, but also the conference organisers for providing such a great collection of people, content and ideas. Reflecting on the conference, I think there were a number of key messages and highlights which resonated with me. The first major message for me was that to well and truly solve the issue of food security and feed the world’s growing population, that we have to move away from the remaining amount of subsistence farming and move to a full production farming system globally. While developed countries have mainly moved to full production systems, it is clearly the developing countries that still have the greatest potential for improvement. In my opinion this will require greater effort in creating transparent, and fair markets for agricultural commodities, such that a financial value can be placed on growing a crop, and that farmers in developing countries can make a profitable enterprise out of their land. Making a profit is key as it has many consequential effects. These include creating the ability to pay for their children’s education (thus helping alleviate poverty), the ability to re-invest into their farm (to increase production and grow their business), and also the ability to make farming a respectable career choice rather than just a way to feed your family. The second major message for me was about technology and how it can best play an increasing role in farming, especially in developing countries. Having followed the evolution of farming technology in Australia, I am of the opinion that successful technologies must achieve one of two outcomes, that being to either increase profits, or decrease costs. However, as seen in other industries, there is often a number of technologies developed that on the surface seem like they are handy tools, but fail to provide a real value proposition to the farmer. Thus I think that emphasis must be placed on technologies to achieve either of the two outcomes. For example, an increase in profits could be achieved by an improved yield or quality, while a decrease in costs could be achieved through a lower labour cost, or less chemical input costs. Consequently I think that technologies aimed at farmers in developing countries must also achieve one of these outcomes, otherwise they too will fail in the long term. While these two key messages were a subset of many takeaways for me, they were the ones that resonated with me the most, especially considering my private enterprise background. I would like to take this opportunity to again thank the organisers of the Crawford conference, and especially Cathy Reade for making it an interesting, well-organised and valuable event for me to attend. I look forward to following the Fund’s future work, and am pleased to commend their cause as one that has a real purpose and is evidently having an impact.